Thou Or I Or Both is a thrilling start to what looks to be a promising career. Marc-Antoine Robertson has seen and travelled the world: born in Montreal, lived in Paris, and now calls Halifax, Nova Scotia, home. 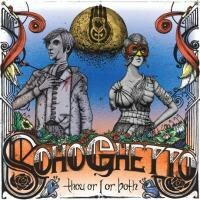 Listen to his debut album with his band SoHo Ghetto called Thou Or I Or Both and you can hear a little of the world-weariness in the grandiosity and pomp of the record’s nine songs, of which the first four run five minutes or more. This is music for those who appreciate bedroom rock performed on a stadium scale, for fans of Arcade Fire, for fans who simply love good music. For an independent release, Thou Or I Or Both comes across as full-bodied and sprawling. Opening cut “One At a Time” recalls Canada’s Arkells with its pummelling piano banged out in true Springsteen-esque fashion. It also boasts an awesome gospel call and response at the song’s very opening. It will leave your jaw on the floor. However, the album as a whole stands up to close scrutiny. “Message” is sung in French, which shows Robertson’s mastery of Canada’s two official languages. “Sidekick” has a very east coast, folksy feel to it, and is the kind of stuff that could soundtrack pub nights. “Rook” is a lilting ballad with an effective melody that could have come out of any ‘80s soft rock outfits. “Sisyphus” shows the pianos re-emerging with a vengeance. So Thou Or I Or Both straddles varying styles and genres of music, but remains wholly engaging and compelling in doing so. You’re left at the end of this disc catching your breath. This is dreamy and heavenly material. Let me put it bluntly: even though this is a self-released album, if this doesn’t catch fire with Canada’s Polaris Music Prize jurors, I would be highly, highly surprised. Thou Or I Or Both is the kind of thing that makes music critics and jurors froth at the mouth, and if you’re salivating by the time you’re through with this, that only means you’re looking incredibly forward to that difficult sophomore disc. But I think Robertson has the chops, and Thou Or I Or Both is a thrilling start to what looks to be a promising career.